Joep and Joy in Traun! 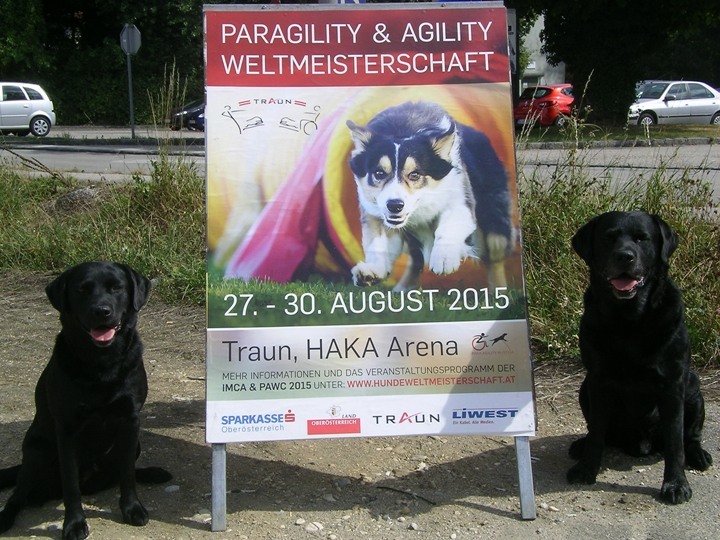 On sunday 23 August we drive away to Traun in Austria for taking part into the 14th ParAgility World Cup with both dogs Joep and Joy. 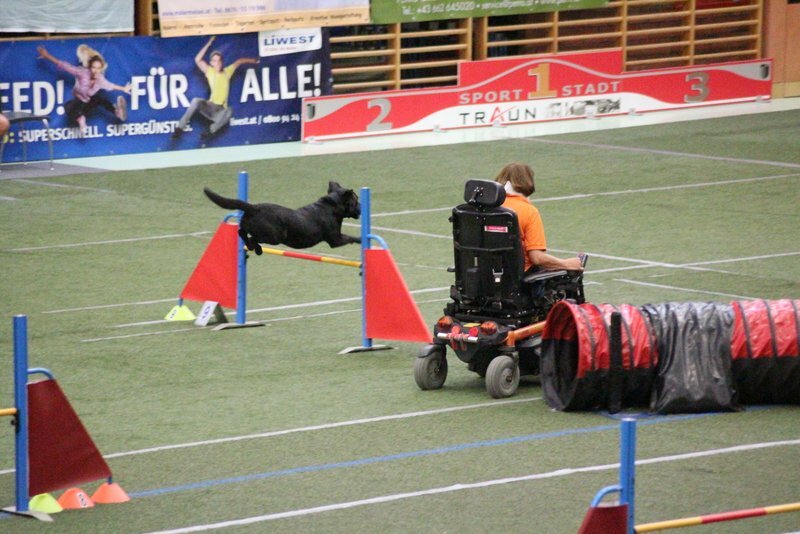 On thursday the 27th trainingsday for handlers and dogs acquaintance to the ground and obstacles of the Sport Hall. Total 106 competitors for PAWC from 15 different countries. 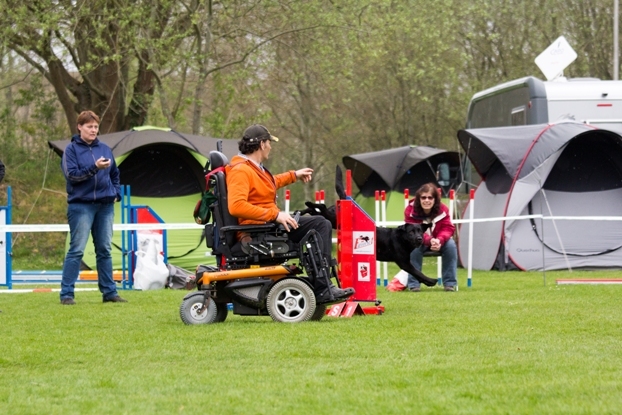 In our group of disability, users electric wheelchair, we have 18 competitors. The first matchday, friday 28 August, Joep was running a very nice clear round, but not with the fastest time, so a 6th place. Joep was running good and became the 4th place, just not a place on the podium, but it's making exciting for Total Results. On the last matchday Joep was making a mistake, so his place on the podium for Total Result was gone..but Joy was running fantastic and again a first place !! Joy in action on PAWC 2015! 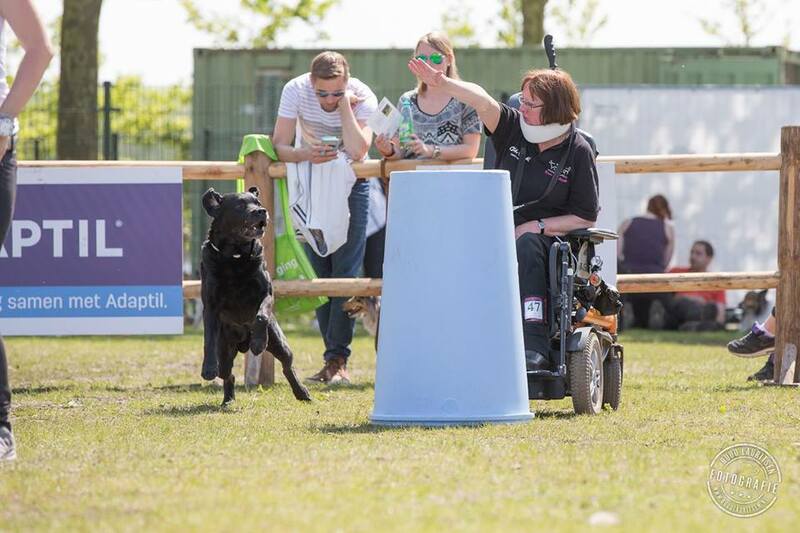 Joep in action on PAWC 2015! For Joy the 5th place Total Results and Joep the 6th place! Nice results, sure for Joep related his age of nearly 11 years! Two times a gold medal we could take home,......I was very proud of my two superstars! Next year the IMCA & PAWC 2016 will be organised in Czech Republic. Always a very nice moment when the Dutch Anthem is playing! I had entry with Joep and Joy, but Joep was still a little injured (rib bruised) and of course it was very important he will feel well when we went to Austria for taking part into the ParAgility World Cup.... so he was checked out. 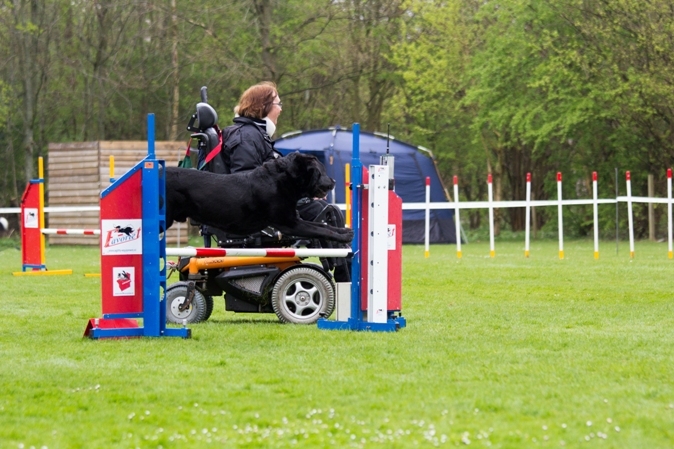 Also on the Jumping as Game-course we had not a disqualification...on the Agility-course we had, but with very nice elements! 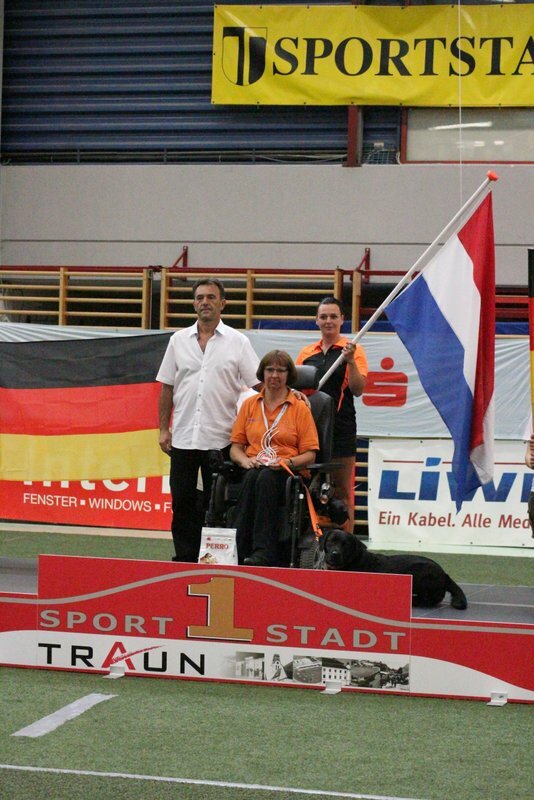 A good training before we trafel to Austria for taking part into the ParAgility World Cup. 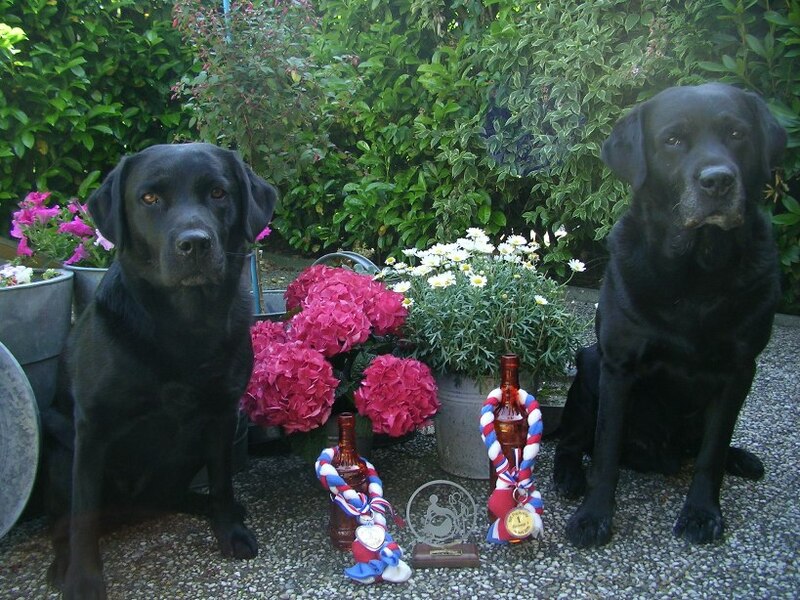 They will, together the Dutch IMCA Team 2015 the Duch Flag represent 28 untill 30 August in Traun, Austria. 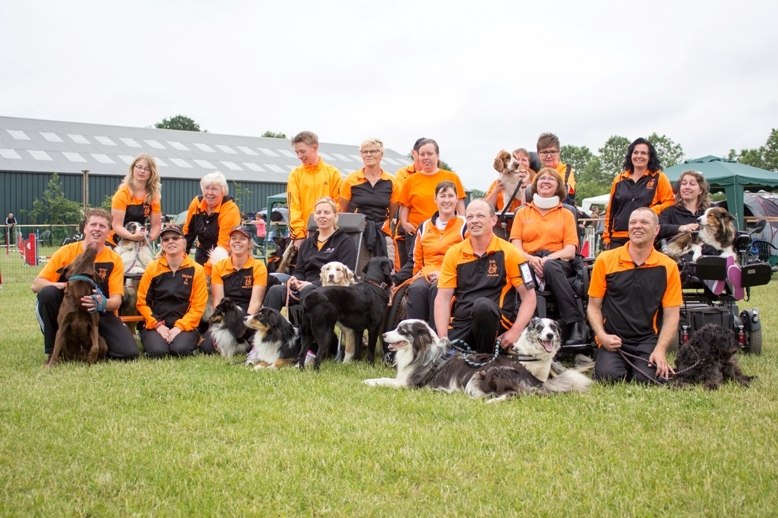 Total for Dutch Championship Para-Agility 23 competitors of which 13 will take part into the 14th ParAgility World Cup in Traun, Austria the end of August. 1th and 2th place Totall Results NK ParAgility 2015! Joy very fast taking the poles! 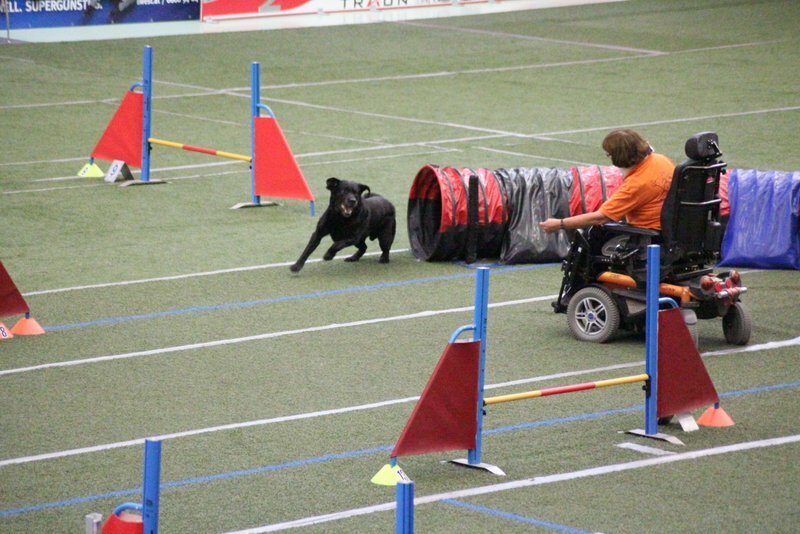 For Joy her first agility-match in the Classe B1 large. Sometimes I need very short turns in the course, that's not always possible with my wheelchair...but more challenge for training!! 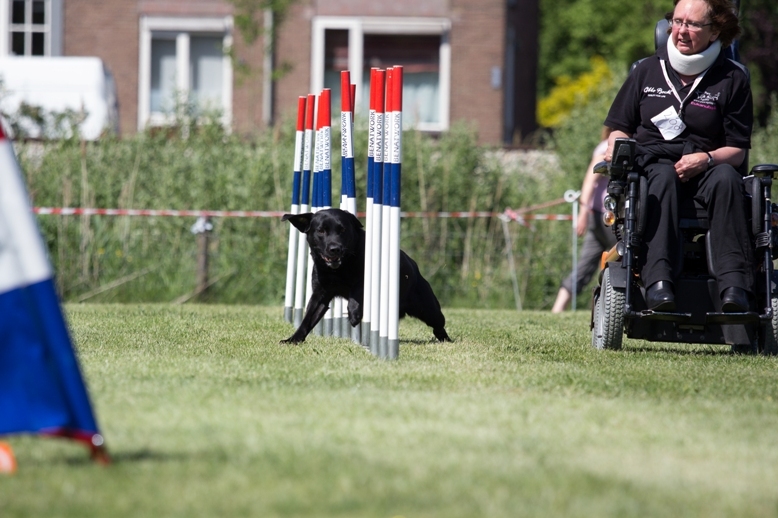 We had entried for the agility-match on Animal Event, organised by Agility Friends but a recognized agilitymatch for competition Raad van Beheer. A very bumpy field, but nice course maked by judge Ron van Straten! 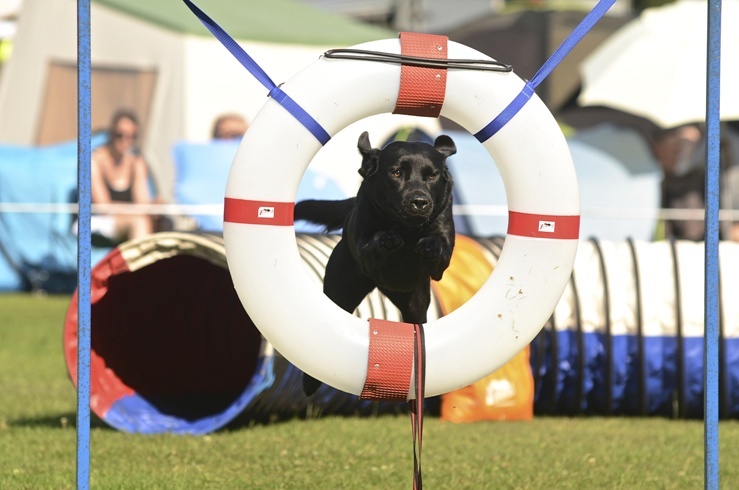 Joy had a disqualification on the agilitycourse and also on the Jumping ).......the last one was really my fault!'. Even I had entried for the Workshop Hoopers by Liesbeth Hogendoorn and her Team of Hoopers the Netherlands (www.hoopersnederland.nl ) with Joep, my oldest dog. YES....YES...we became our 3th Excellent!! The first couirse, a Jumping, only one refusal....but on the Agility-course Joy had run a very nice clear round, good for our 3th needed Excellent to promote to second level! 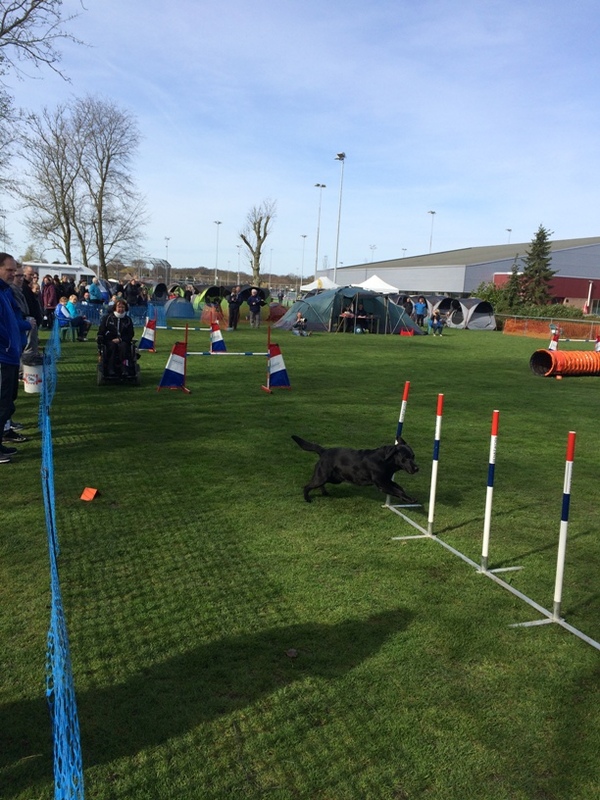 It was possible to run an Agility-course and Jumping in the morning, but also in the afternoon for A-classe....but I had make the choice to run even with Joep in the afternoon for Veteran-classe. 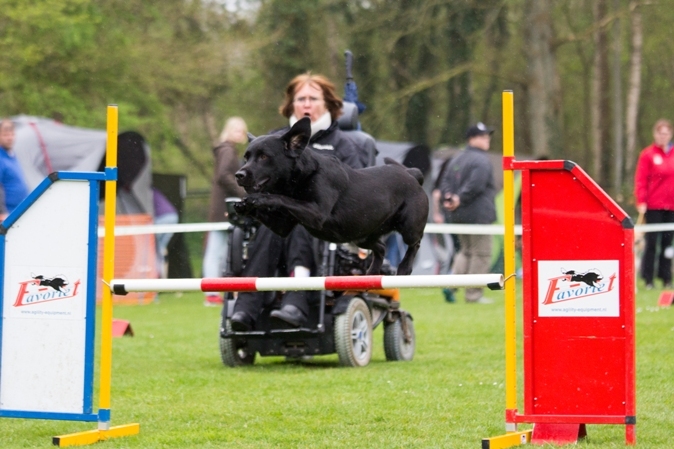 Also for Joep a nice matchday...on the Agility and Jumpoing Course both a cleasr round! In spite of his age of nearly 11 years, his condition is vergy good ! 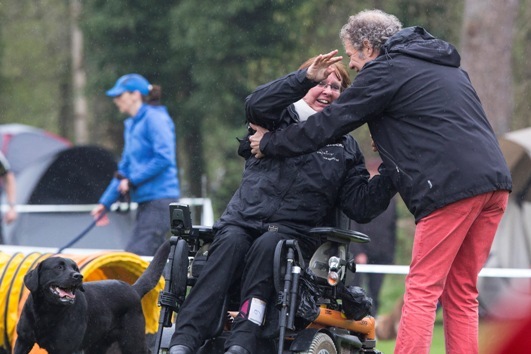 At the end of the match we have fun...the Judge Henk Postma asked me and Yvonne Dozeman to try our wheelchairs on the course ( with our dogs) !! 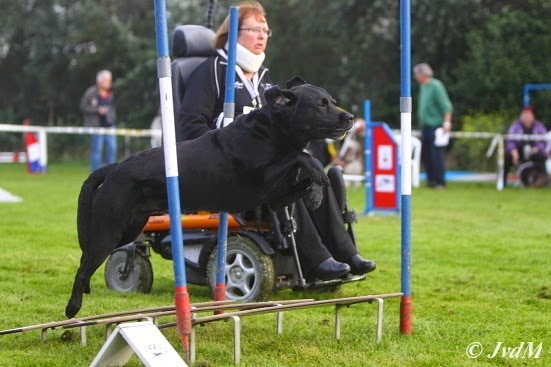 He admit that it's not easy to practise agility by wheelchair and prefered the wheelchait by hand! Joep finishing after a very nice clear run ! Joy working for her 3th Excellent!! On the Game-course we became 9th of the 64 competitors.